Albert's Awning is open Monday – Friday, 9 AM – 5 PM and Saturdays by appointment only. Our products are showcased at 512 Patcong Avenue in Linwood, New Jersey. In addition, you can visit our digital showroom by clicking here. For the quickest delivery turn-around, we encourage our customers to order through a company representative. The speed of completion will vary considerably depending on availability of materials and size and scope of the order. Do you offer price quotes? YES. To receive a free price quote, please phone our office to arrange an appointment. Do you have any product brochures? Product information can be found throughout this web site, as well as, Albert’s showroom floor. We offer full and custom installation services for all our products. Our team will measure and make custom diagrams for your boat, furniture, and awning needs so to give you the most say in the manufacturing and installation process and finished product. What is the Cancellation Policy and Return Policy? We have a 3-day (72-hour) Cancellation Policy. All cancellation requests must be made by the customer within 3-days (72-hours) of placing an order. All Albert's Awning products are custom-made based upon specific and unique selections. Cancellations must be authorized in advance. Please contact us for assistance. 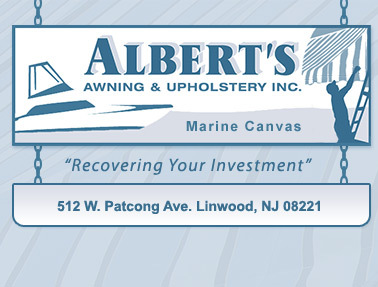 All Albert's Awning products are custom-made based upon specific and unique selections. As a result, Albert's Awning does not offer product returns or refunds after the initial 3-day (72-hour) Cancellation Period. Only defective or damaged units will be exchanged. Damages due to misuse or carelessness are NOT covered. Are fabric and metal samples available? Fabric and metal samples are available at our storefront. Note: Due to varying configurations of computers, monitors and/or video graphics cards, the website photos may not be true to life. Therefore we recommend choosing color samples at our store or company representative. Is price different for solid vs. stripe patterns? NO. There is no price difference for solid or striped patterns. Can graphics be applied to the covers? Graphic applications of logos and lettering are available for our product lines. Custom graphics are additional costs and prices vary depending upon the complexity of the artwork. Please contact us for details. Are your awnings suitable for snow? We suggest residential awnings be taken down during the winter months. Can the awnings mount to vinyl siding or brick surfaces? YES. All units are delivered with standard mounting screws and mounting plates/pieces designed for multiple types of hardware and siding surfaces.